Editors Note: Our partnership with the US Peace Corps enables us to reach both boys and girls throughout the world. In this article, we take a closer look at the impact of this partnership on girls and women. 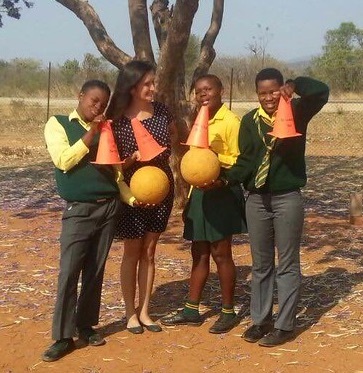 Through the partnership that Grassroot Soccer has with the United States Peace Corps, the power and energy of GRS spreads to women and girls in some of the most remote, rural, and low-income communities across the globe. 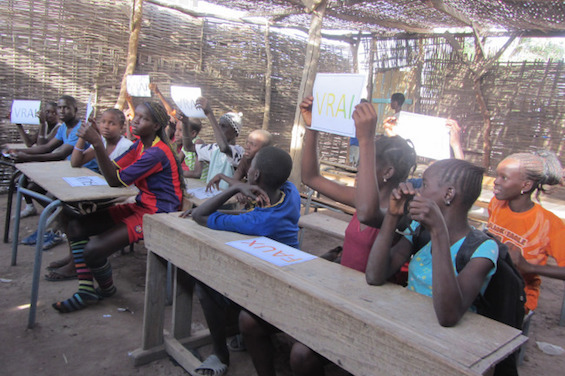 Peace Corps Volunteers (PCVs) get trained directly by GRS Master Coaches or are sent GRS starter kits to implement interventions in their rural communities around the world. 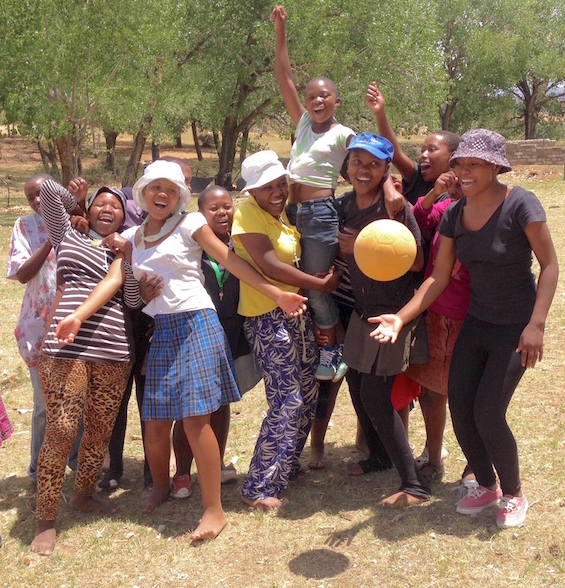 Included below are a few touching stories that PCVs have shared with us, in their own words, about the impact Grassroot Soccer has had on their female counterparts and/or female participants in their communities. It was the first day of term 3, when Lucia, Lebo, and Cecilia barged into the library, demanding that I coach Grassroot Soccer for grade 6. These three girls had just graduated from GRS at the end of term 2, and were now insistent that the grade 6 learners get the same opportunity. Throughout GRS, the players are told to teach everyone they know about what they had learned that day in practice, from their Gogos to their dogs (“No, Ma’am! Our Dogs? No, not our dogs!”). They are told from day one, that they must be leaders in their community and school, and these three girls were embracing this idea. Before I even was able to put my bag down, they explained that they wanted to help me coach Grassroot Soccer for the grade 6 learners. They told me that they would come to every practice, make sure every grade 6 learner participated, and that they would translate as necessary. I was hesitant, but since these three girls seemed so determined, I couldn’t say no. Although I am only halfway done with the curriculum for grade 6’s Grassroot Soccer program, I couldn’t be more thankful to these three girls. They have proved to me that learners are the best counterparts. They are dedicated, hardworking, and determined. They translated the pre/post test into Sepedi, since grade 6’s English is very limited compared to grade 7. Before every practice, they collect all the students. They make sure the students are listening, and translate to make sure all the grade 6 learners understand completely. Most importantly they model what it’s like to be an outstanding student, they have shown how to take on a leadership role, and how to put others before themselves. 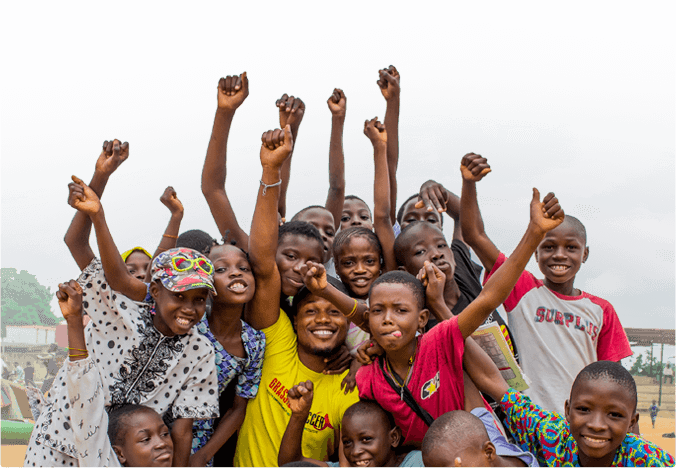 They have made Grassroot Soccer a sustainable program, because they are hoping to continue coaching it next year, after I have finished my Peace Corps service, something I didn’t think was a possibility before them. They have also taken it upon themselves to talk to their classmates about HIV prevention and treatment. I couldn’t be prouder. From the first practice, I knew that Grassroot Soccer SKILLZ was going to be the best training I had ever been a part of. The…culture immediately clicked with the kids, including kilos, energizers, and saying fun things like, “boo-yakah!” and “simunye/sisonke!” I was constantly impressed with the bravery, confidence and intelligence of our group. In a country where girls are often silenced and ignored, our girls shone. They were often the first to raise their hands and share, and only girls volunteered to do the condom demonstration, which we did with Practice 8// Circumcise and Condomise. At graduation, the students read poems, sang, danced and prepared a drama for their parents and selected community members. I was again so proud of them. I really feel as though they learned a lot, especially in terms of new material about the dangers of older partners, sexual networks, and the benefits of circumcision relative to HIV. I strongly look forward to the next SKILLZ intervention with a new group of kids. After completing my first Zinduka program I found one of my main successes was the increased involvement of the female participants. When I began the intervention, many of the girls were too shy to answer any of the questions. They would whisper answers among themselves, but let the boys answer. However, towards the end of the intervention I noticed that more and more girls were excited to participate in the games as volunteers and also with the discussion. They learned that their participation mattered just as much as the boys’ and they became empowered to share their answers and opinions. Completing the GRS SKILLZ Girl curriculum was one of my favorite and most rewarding projects I’ve done this far in my Peace Corps service. This program gave me an opportunity to reach out to the young generation of Senegalese girls and empower them to know their rights and know they have the power to create their own futures. It was amazing to be able to create a safe space where the girls could learn about sexual health and other topics otherwise not discussed in a conservative Muslim culture. There were often beautiful, thought-provoking discussions giving these young girls a voice often silenced in their culture. I also formed a close friendship with my counterpart, as we administered the lessons and had deep, important cross-cultural discussions.